You can have fun playing the Adagio and Fugue in C minor, which opens this CD, and asking your friends to name the composer. The Adagio is extremely stark yet has a disarming mixture of looking back to the French baroque overture in its disciplined loud phrases and forward to the visionary harmonic palette of late Beethoven in the alternating soft phrases. Only in the latter's brief, glimmeringly humane moments might you guess Mozart. The fugue sounds even more modern in the grim jauntiness of its opening, yet also compulsion to carry the argument forward and open out its basic elements dramatically. 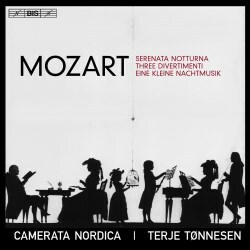 Much of the credit for realizing the distinctiveness of this work—and, throughout this CD, shining a searingly fresh, Swedish light on Mozart—goes to Camerata Nordica (henceforth CN) directed from the violin by Terje Tønnesen. This is a modern instrument string ensemble of 15 to 20 players but the bold dynamism of their approach and eagerness to bring out harmonic clashes in the music are more often associated with period instruments. The very first note of the Adagio is a loud, gutsy, staccato bottom C from the cellos and double basses. While its disciplined material becomes more raucous, its soft material grows more silkily unearthly. I used the Mozart 225 complete edition (Decca 483000, CD68) for comparison. The period instrument Accademia Bizantina (hereafter AB) conducted by Ottavo Dantone in 2016, times the Adagio at 2:33 to CN's 3:11, closer to Andante. Thereby it lacks the airy expansiveness through which CN reveal its vision. In the fugue, AB timing at 4:02 to CN's 3:34 is less crisp in approach but does convey the juxtaposing of the instrumental parts with clinical objectivity: this could be a graceful ballet. CN do not gloss over the slithering chromaticism but also provide more light and shade through dynamic contrasts, not marked in the score but judiciously applied and welcome. From an unfamiliar work to one of the best known and most recorded, Eine kleine Nachtmusik. But can CN make this sound fresh? They begin crisply but as soon as the soft second phrase arrives there is a courtly grace. Their second theme (tr. 3, 0:48) has a carefree charm and the third (1:01) trips along with an engaging coyness while even at the end of the contrasting vigorous statements there is a subtle paring down, anticipating the following soft ones. The development has the potential for despair but I it is dealt with temperately. Again I compared wityh AB. They provide equal energy in the loud passages and more sleekness in the soft, but overall for me have less character than CN. That is partly because of AB's emphasis on brisk deportment, timing at 4:58 in comparison with CN's 5:26, though AB then additionally repeat the movement's second section. CN also provide a fuller dynamic contrast, both between loud and soft and judiciously grading a range between, with the bonus of a BIS SACD recording making this appreciable. In the second movement Romance CN bring a touch of winsome fragility to their sunny and smiling presentation of the theme and the slightest brief slowing in the transition at the end of Variation 1 (tr. 4, 1:24) which satisfyingly points up Mozart's lovely sleight of hand. CN's Variation 2 (2:44) is more edgy than AB's because CN's semiquaver runs in the inner parts make your flesh creep. They make the return of the theme, especially after this, an event you do not just expect, as with AB, but welcome. And another barely perceptible slowing by CN, at the beginning of the coda, makes it affectionately tender. The Minuet, ever forthright and confident, sports in addition thatnks to CN a swaggering hauteur in the peremptory treatment of its closing trilled flourishes. The homelier Trio is made more folky by replacing, blending or alternating the first violin melody with Swedish nyckelharpa. AB bring to the Minuet a polite, smiling swing. Their Trio is intimate and curvaceous. The light and feathery opening of CN's rondo finale is soon challenged by the feisty oomph of its second strain but, as often in Mozart, these are seen to be two assured characters able to hold their own and coexist. CN's tempo is more Molto allegro than the marked Allegro but is stimulating. Their vigour is never heavy, the first violins' quaver runs shimmer and the busy quaver runs in the second violins and violas are clear and deft. In the coda, the scrunches between first and second violins are relished. AB's rondo is more civilized than CN's but in being so sounds comparatively tame, though, unlike CN, they do observe the second half repeat. Serenata notturna uses the familiar divertimento grouping of 2 violins, viola and double bass as concertino with a contrasting or supporting ripieno orchestra of strings and timpani. So the opening March played by CN has hefty tuttis while the concertino passages have a twinklingly fluent, folky quality. In the second section, I especially appreciated the lovely realization of the ripieno's soft timpani rhythm backing pizzicato strings as for me generally the timpani were too booming. I compared the 1959 recording whose ripieno is the London Symphony Orchestra conducted by Peter Maag and concertino is fronted by first violin Hugh Maguire and second violin Neville Marriner (Mozart 225 – CD99). Here the tuttis are crisp, the concertino passages suave. CN's Minuet is marred for me by the thunderous attack of its tutti entries. Taking 4:05 to CN's 3:26, Maag is a deal steadier but not lacking in stateliness, while having also more charm and sunny elegance. CN's Trio, however, is graceful and sleek. In the rondo finale (tr. 9) CN emphasise the playfulness of the frequent changes of mood, yet in the case of the Adagio opening of the second episode (1:10) this becomes one step in a process rather than, as in Maag's account, a savoured interlude of tender sobriety. On the other hand, CN's ensuing Allegro (1:39) has an attractively light friskiness, their merrymaking enhanced by adding a violin mini-cadenza (3:06) to make way for the fourth statement of the rondo theme and a timpani riff (3:41) to usher in the fifth statement. In the Divertimento in D, K136 CN’s sound is very bright, the effect both scintillant and abrasive, albeit with more sheen than power, the lower parts simply providing a guttural rhythmic support. The appoggiaturas have a brutal jocularity. The pace is unrelenting. CN's opening Allegro, timing at 3:46, is only a smidgeon faster than the 3:57 of the 2017 recording by the Manchester Camerata / Gábor Takács-Nagy (Chandos CHAN 10958) but seems more breakneck. You marvel at the virtuosity but hardly have time to relish it. Takács-Nagy (hereafter T-N) gets more verve through a more purposeful sense of statement, more chattering articulation to the violins' semiquaver runs and more nuance to the way the first violins' sequence of three sustained notes and descents hover in the air and are then released at the end of the exposition. Where CN are quite telling is in the theme in D minor in the development (tr. 10, 2:22), dolefully sustained in the first violins against chillingly creepy semiquaver runs in the second violins. The challenge in interpreting the Andante is how the first violins' descant can steal upon the ear over the repetitive homely material and the effect thereafter. With CN, the homeliness is quite thick in texture so the descant does not emerge as clearly as with T-N but, once the climax of the first violins' statement is reached, the ruminative aftermath is more sunnily realized by CN. In the Presto finale it is the second theme (tr. 12, 0:17) that is the more endearing because its light start and repetition, followed by a more assertive phase and then flashing sweep of semiquaver runs makes for a more appreciable series of events. CN deliver these with coruscating brilliance, but I prefer T-N's slightly more modest tempo. It conveys more humour, and variety is achieved by playing the repeated phrases softer, an effect not marked in the score but an imaginative intuition. The first violins' main theme of the opening movement of the Divertimento in F, K138 is resilient and needs to be, given the second violins' insistent jabbing below. With CN, this is a battle stimulatingly engaged by both. The second theme (tr. 16, 0:38) gradually acquires a briefly expansive melody in the first violins in which T-N finds more charm, as well as more light and shade generally, but CN's sheer sweep remains compelling. In the lovely Andante CN go for a more dramatic realization which misses T-N's warmth and gentleness. CN's opening for me overeggs the climax of the first strain, while the leap in the first violins to a sustained high B which begins the second strain, marked soft, could be more noticeably softer, though making the following leap to high C softer is a telling, though not marked, effect. In the recapitulation the first leap is again over-loud and now we have to wait for the added, third leap for a softening. Nevertheless the greater urgency CN give the development is certainly warranted by the music's change of character. I doubt it is humanly possible to give a more vivacious account of the rondo finale than CN do. In its first episode (tr. 18, 0:13) you will enjoy the semiquaver runs in the second violins and violas but I got more involved with the performers as I became more attuned to their discipline. The change from F major to D minor for just the second episode (0:33) is boldly emphasised to eerie effect. However, the third episode (1:05) is light and smiling, the repeat of its first strain varied by being played pizzicato, an unmarked but satisfying innovation. T-N, a touch more leisurely, seems comparatively routine in the rondo theme statements but does obtain more contrast in lighter, airier treatment of the episodes, the rhythms nicely sprung and a fuller dynamic range employed. The Divertimento in B, K137 begins with a slowish (Andante) movement depicting someone in two minds. A soft, descending phrase of pleading and longing is quickly followed by a loud, rising one of firm resolution and this is the pattern of the first movement. In the second strain, when the melody attempts to sigh and descend a little it's followed by brusque rising phrases. All this is effectively nuanced by CN. Here I compared the Camerata Accademica des Mozarteums Salzburg/Sandor Vegh in 1986 (Capriccio C7024). Vegh goes for a smoother overall line and less dynamic contrast, but his texture is thicker and the sequences in the development become monotonous, whereas CN carry the conviction of unwavering emphasis. For the central movement you are knocked back by a fast tempo where you would expect a slow one, especially with the unquenchable vivacity of CN which also incorporates some stimulatingly pert staccato articulation towards the end of the first section. The second section quietens down briefly until recurring loud chords guarantee your continuing alertness. Vegh takes everything more steadily but thereby lacks CN's vigour and seems calculated. The finale is an ingenious rondo with a calmer first episode (tr. 15, 0:13) that cannot resist an ostentatious conclusion and then a triumphant second episode (0:21). The third episode (1:04) is more florid, then exploratory. CN negotiate all this with consummate ease. Vegh is again steadier and thereby more formal, which makes the third episode more civilized where CN better convey Mozart's delight in quirky inventiveness. CN’s bold accounts grab Mozart by the scruff of the neck to present him with renewed vigour. Much of the time I liked them and I hope my comparisons have revealed gains in this approach as well as losses. But beware: read my colleague Brian Wilson's very different review and listen to the samples.